Asian Theme landscaping Q? - We have a north facing garden on a slope subject to late afternoon sun. Would anyone be able to recommend Asian themed plants and a dry riverbed that could do well here? Thanks for any comments here. It sounds as though you have several several challenges there: northwest exposure with afternoon sun, slope, and likely drainage/erosion if you're considering a dry creek bed. You'll likely be better off, and save money in the long run, if you consult a good garden designer in your area. He or she will be able to evaluate your soil, moisture, erosion, etc., and generate a planting profile that will be successful. Good luck! Thanks so much! Will follow your advice I think. Lovely glass pieces - Where can I find them? Thanks. These were made by a glass artist named Victor Chiarizzia in Asheville, NC. He does have a website; perhaps you can contact him through that. Good luck! Glass - Beautiful!! Gorgeous design. I've been reading your stories at Houzz. I learned a lot from you. Thank you! Thanks so much for your comment. Happy gardening! Hi. These pieces were custom made by a glass artist in Asheville, NC, named Victor Chiarizia. You may be able to contact him through his website for more info. Good luck! BEAUTIFUL GLASS - What are these that look like glass? Hi. Those are hand blown glass pieces. Thanks for the question. Add glass. Nothing captures, reflects and refracts light like glass. The pieces shown here were custom designed to mimic new shoots of plant growth and placed so that they rise from a sea of shade-loving ground cover.One thing to consider before installing a glass sculpture in your garden is possible breakage from overhead limbs falling in inclement weather. Assess your budget and tolerance level for loss before purchasing your glass. If you decide to invest in a glass garden sculpture, you'll get shining rewards. 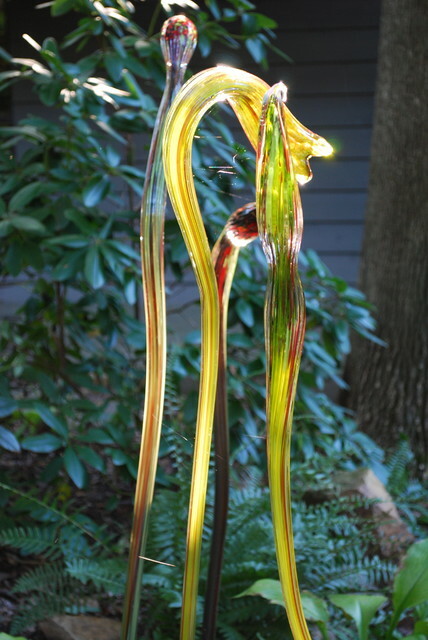 Glass art is another choice for the philosopher’s garden. Notice how this installation has a mesmerizing quality in that it both reflects and absorbs light. When choosing glass art for the garden, be mindful of the fact that falling branches and hailstorms can cause significant damage. 6. Heighten your awareness of everyday subtleties. Gardeners and artists see light in a way that few others do. Seasonal changes in the sun’s intensity and position go unnoticed by most of us. This installation of blown glass captures, reflects and refracts light in a way that heightens our awareness of it. Really fancy a go at glass blowing to create something like this for the garden.The light shining through them is a real lift. I love the use of glass in the garden- and we have lots of light.